Bethesda is bursting with burgers. Kraze Burgers, The Burger Joint, Bold Bite, Five Guys Burgers and Fries, and Bobby’s Burger Palace all serve up burgers in various iterations. The latest addition to the scene is Smashburger, a fast growing “better burger” chain, which has opened its doors on the corner of Cordell and Norfolk Avenues. I was invited to a media preview recently, where I had the chance to sample a variety of burgers, sandwiches, and sides. I’m on the lookout for what makes a “better burger.” After stuffing myself with everything the restaurant representatives have to offer, I’m pretty sure I now have the answer. It’s easy to be skeptical about a burger that needs to stand out in a crowded field. But Smashburger has a good deal in its favor- and I mean that in every sense of the word. 1. Value. 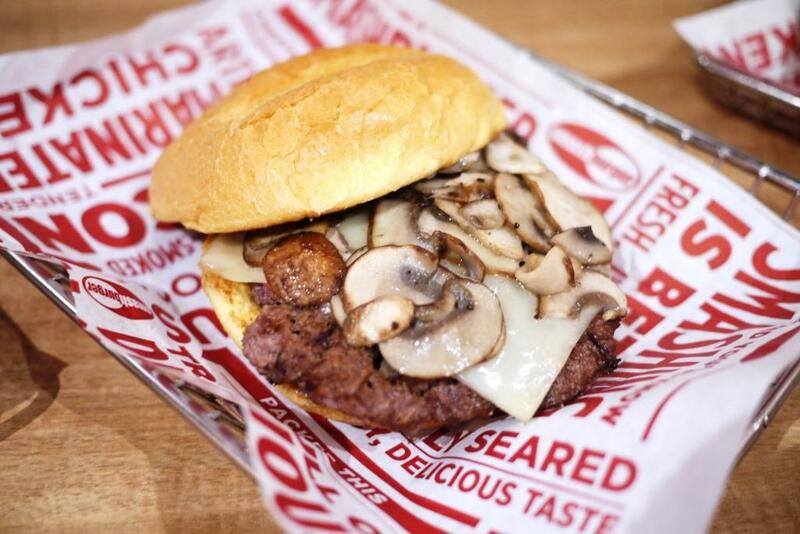 Smashburger is offering a a Truffle Mushroom Swiss burger with truffle mayo, sauteed baby portabella mushrooms, and Swiss cheese on an egg bun for under $7. This burger is incredibly tasty, and at this price, I might have to have two. 2. A Really Good Veggie Burger. I’m married to a non meat-eater, so if I want to go out for a burger, it’s helpful if there’s something appealing for him to eat. A veggie burger usually doesn’t cut it. 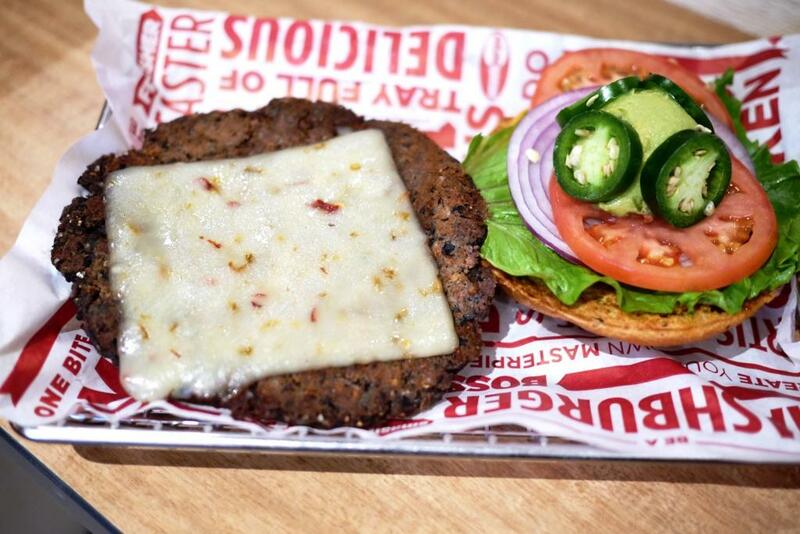 Smashburger’s housemade spicy baja veggie burger is an exception to the rule. Fresh jalapenos, guacamole, pepper jack cheese, and chipotle mayo on a spicy chipotle bun bring layers of flavor and heat. I can’t believe I have veggie burger envy. Next visit to Smashburger, I’m going with the baja burger. 3. Healthy choices. A burger place isn’t a burger place without fries, but what about veggie frites- flash fried carrots and green beans? Smashburger’s got ’em and their good. Grilled chicken sandwiches and signature salads also lend variety to the menu, and satisfy the diner looking for burger alternatives. 4. Appealing partners. Sometimes we’re judged by the company we keep. Smashburger is in good company. They have just signed a partnership agreement with HONEST Tea, and is now offering fresh brewed iced tea at all locations. If iced tea doesn’t float your boat, then a hand-spun Häagen-Dazs shake, local craft beers, or IBC root-beer float may do the trick. 5. Regional burgers. Each area of the country gets its own regional burger, highlighting the unique flavors of the area. DC has the Capital Burger, topped with grilled onions, aged Swiss cheese, baby arugula, applewood-smoked bacon, tomatoes and mayo on a brioche bun. It’s designed to reflect DC’s “air of sophistication.” If truth be told, I think DC’s burger could be a little better. Maybe it needs a little “Secret Service” sauce to top it off? 5. Smashing! The burgers here are incredibly juicy, as a result of the smashing. 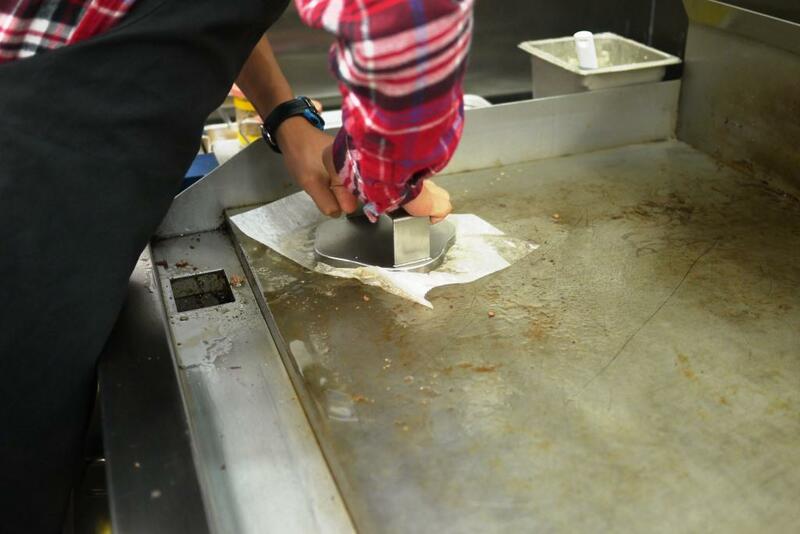 A specially-designed tool keeps the juices in, and when you take 100% Angus Beef and smash it on a 400 degree grill, it sears in the flavors. The smashing really is a secret weapon, and it works. Does Smashburger really offer a better burger? I think it’s up there with the best. What distinguishes Smashburger, however, is its winning mash-up of variety and value.